The announcement last week of new French legislation that will ban speed camera warning devices has been met with anger by motorists. French Government proposals will outlaw the sale and use of speed camera warning devices. Using a warning device will cost a driver €1,500 in fines with six penalty points whilst selling a device would result in a €30,000 fine and the possibility of two years in prison. The Government also announced that warning signs would be removed as part of their response to a 13% increase in road fatalities in Q1 of 2011. A Facebook page, set up by the Association Interprofessionnelle de l'AFFTAC, a group of warning device manufacturers, has received 128,000 followers in three days and even the normally vocal road safety campaigners have sided with motorists and called for a re-think on the plans due to come into effect in September 2011. Will the PGPSW camera database be outlawed, or does it only apply to camera detection equipment? We may just release a Cheese Camera Database. All the files renamed so any nosey officers wouldn't smell anything funny (except cheese). I've just mentioned this in tomorrow's newsletter. It may be that we remove France from the Europe download as we have done with Switzerland but then offer the removed data as an add-on for those who wish to use (it at their own risk of course). Since when has it been considered illegal to prevent someone from breaking the law? We're all being hoodwinked by the perception of right and wrong, and not the reality. As we saw with the gentleman some months ago, who flashed oncoming motorists to the fact that there was a mobile speed camera operating in the vicinity, and they go and prosecute him? His defence should have been that he was being a good citizen by preventing a crime before it occurred. To draw a parallel, if you asked someone not to drop litter just as they were about to, and as a result you prevented them from dropping litter, would the local authority then have the right in law to prosecute you for the act of prevention. Speed is not the issue here, it is down to educating drivers and a greater police presence. There are plenty of fools on the road - we see that every day, but where are the police when it happens? You can't capture most of the bad behaviour on camera, yet it must account for most of the accidents. I see this as yet another venture into easy money-making for government. In residential areas the introduction of average speed cameras would massively cut serious injuries and fatalities, yet all that local politicians can do is waste precious metal, time and money erecting 20MPH signs that no one heeds anyway, and are almost impossible to enforce until after the event, by which time it is too late when a child has been killed, maimed or seriously injured. Those politicians don't do this for anyone's safety, they do it for personal glory - "look what I've done for my community (nothing!)". I just want to know how they will police this. Are they going to stop every vehicle and check them? It will be like every other offence such as the hi-viz vests, spare bulbs, warning triangles etc. Gendarmerie stop you for whatever reason and once they have it's open season. 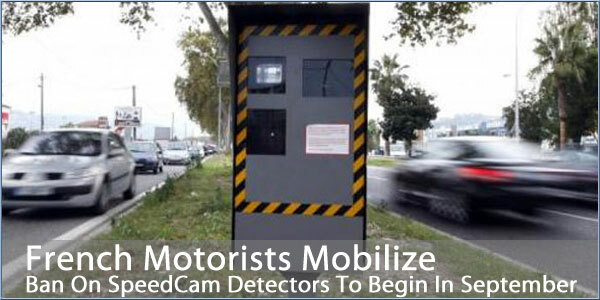 I'd guess that the major target of this is laser/radar detectors and the hardware speed camera market. Coyote has been very successful in France with its service that allows its users to warn each other in real time. Does this mean they'll stop printing the time on entry toll tickets so that they are not helping you in calculating the earliest exit time without a calculated speeding offense ? That will stop me doing 130 (K or m ?) from Paris to catch the last evening ferry !! I have another form of speed camera warning device, (and I suspect that many other members will be in the same position) It's an AA road atlas of France, and in large letters on the front cover says that it has details of french fixed camera sites.and I have found that it does I wonder, if when in France. my passenger uses the map pages, follows the route we are on, and tells me that the road atlas says that I am approaching a camera site and should slow down, is an offence being committed? If not, then surely a sat nav with the same camera sites electronically stored, rather than on a paper page should be permitted. Also. I suspect that the French (and possibly the Swiss) have not yet appreciated the difference between an active device, (eg, one that will momentarily blind a camera) and passive devices, like my paper atlas, or the same information electronically stored on a sat nav. Regards, Legalspeed. It is generally accepted that active devices are 'detectors' in so far as they receive the radar/lazer transmissions and cause an alert. Things tha t 'blind' a radar /laser cam are jammers. Both the types that I have described above are, I believe, specifically banned in UK and some other countries.